In Deo v. Rias (1832) 8 Bing, 178, Tindal, C.J. held that "we are to look at the words of the instrument and to the acts of the parties to ascertain what their intention was; if the words of the instrument be ambiguous, we may call in the aid of the acts done under it as a clue to the intention of the parties. In Chapman v. Bluck (1838) 4 Ring, 187, Park J. held that the intention of the parties may be collected from the language of the instrument and may be elucidated by the conduct they have pursued. Odgers in his Construction of Deeds and Statutes, 5th Edn. by Dworkin at p. 53 stated that in the case of an ambiguity, judicial notice will be taken of the way in which the parties themselves have interpreted their rights and duties under the document. In that case the question was "who was the real purchaser of the goods in question". Gajendragadar, J. (as he then was) speaking for the court held that the appellant acted on account of the disclosed partner and as such he was not entitled to sue. It was also further held that whether the contract was entered on behalf of the principal recital in the relevant document could provide the necessary clue. The letters and the confirmation slips were held to be read in the light of the bought and sold notes and the conduct of the parties was presumed to be consistent with them. The signature or how the parties described themselves was held to be not relevant. Calcutta Steel Co. and Ors. A.M. Ahmadi, M.M. Punchhi and K. Ramaswamy, JJ. In this connection, please note that our name will be shown as openers of the proposed L/C to meet the requirements of exchange control only, and we are not in any way responsible for the failure of the endures to comply with the requirements of the L/C. This L/C is required to be established at the expense and L/C limit of the endures viz. M/s. Calcutta Steel Company Ltd. who would accept the draft(s) and make payment on due date at Calcutta. MMTC of India Ltd. for and on behalf of Harlow and Jones Ltd. Accepted by Calcutta Steel Company Ltd." signature and stamp of the company were put on them. We enclose herewith Bill of Lading No. 1 dated 31st December, 1986 in respect of shipment of 6965.950 M.T. of billets from Gilon. You are requested to kindly endorse the Bill of Lading in our favour so that we can take delivery of the goods. We confirm that the Usance draft has been accepted by us and documents released from our Bankers." CSC had delivery of the goods imported and appropriated the same. On June 29, 1987 on maturity when the appellant presented the three Bills of Exchange to the respondent for payment they were dishonoured. The CSC filed Suit No. 781/87 on the Original Side of the Calcutta High Court against M/s. Harlow and Jones Ltd. and Ors. for a declaration that the said three bills of exchange were illegal, null and void, invalid, inoperative and of no effect nor binding on the plaintiff (CSC) and for delivery, of the said Bills of Exchange for cancellation and permanent injunction restraining the appellant and the respondents Nos. 2 and 3 from giving effect or enforcing the said bills of exchange. The learned Trial Judge dismissed the suit. On appeal the division bench by judgment dated February 25, 1992 in Appeal No. 1134/88 allowed the appeal and decreed the suit. Thus this appeal under Article 136. (3) After the drawee of a bill has signed his assent upon the bill, or, if there are more parts thereof than one, upon one of such parts, and delivered the same, or given notice of such signing to the holder or to some person on his behalf, he is called the "acceptor". 7. The other definitions in Section 7 are not relevant. Hence omitted. Section 32 provides the liability of the acceptor of a Bill of Exchange thus: "In the absence of a contract to the contrary, the maker of a promissory note and the acceptor before maturity of a bill of exchange are bound to pay the amount thereof at maturity according to the apparent tenor of the note or acceptance respectively, and the acceptor of a bill of exchange at or after maturity is bound to pay the amount thereof to the holder on demand. 8. In default of such payment as aforesaid, such maker or acceptor is bound to compensate any party to the note or bill for any loss or damage sustained by him and caused by such default. Section 33 marginal note states that only drawee can be acceptor except in need or for honour: thus: "No person except the drawee of a bill of exchange, or all or some of several drawees, or a person named therein as a drawee in case of need, or an acceptor for honour, can bind himself by an acceptance." 9. It would thus be clear that the maker of a bill of exchange is the drawer; the person thereby directed to pay is called the drawee; after the drawee had signed his assent upon the bill he is called the acceptor. In the absence of any contract to the contrary, the acceptor, before maturity of a bill of exchange, is bound to pay the amount thereof at maturity according to the acceptance the amount thereof to the holder on demand. No person accept the drawee of the bill of exchange, in case of numerical drawees one or all drawees or the person named thereon as a drawee in case of need or for honour can bind himself by an acceptance. 10. Having given our anxious and careful consideration to the facts and circumstances of the case, we find no merit in the contentions of Sri A.K. Sen, the learned Senior counsel for the first respondent which runs thus: that the liability of CSC on the basis of the Bills of Exchange being commercial instruments would arise only if CSC is the drawee and acceptor thereof. Since the acceptance creates a technical contract between the acceptor and the drawer, the parties to the instruments on their face alone are entitled to be dealt with and no other parties to a bill independently could act upon unless it is a case of agency which is not the case of the appellant or of the MMTC. MMTC is the Principal drawee; for the purpose of receiving the goods Letters of Credit were opened by CSC as per the authority dated November 18, 1986 and the Bills of Exchange were addressed to MMTC A/c of CSC. The sale of goods having been taken place on high seas and the Bill of Lading made to the order of MMTC, bills of exchange having been drawn in favour of MMTC, it alone is the drawee in relation to Harlow and Jones Ltd. and seller vis-a-vis the first respondent, CSC being not an agent of the MMTC, the acceptance by CSC is void. The declaration granted by the High Court is, therefore, legal and being a discretionary relief no interference under Article 136 is warranted. 11. Law Merchant always insists that a negotiable instrument must bear no veil but reveal its true character on its face. A party that takes a negotiable instrument makes his contract with all the parties who appear on its face to be bound for its payment. Therefore, the Act insists that a Bill of Exchange makes the acceptor personally liable unless the acceptor states on the face of the bill that he subscribes for a disclosed principal. The usual mode of accepting bills of exchange is for the drawee to write, 'accepted' across the face of the bill and then to sign his or its name underneath. The acceptance need not necessarily be on the face of the bill and an acceptance on its back is also sufficient. In all cases it is essential that the acceptance should be on the bill itself otherwise it is a mere nullity. 12. Bhashyam & Adiga in their Negotiable Instruments Act, 15th Edition at page 362 stated that a bill of exchange, being in its nature a letter of request from the maker to a particular person, no one can be made liable on it but the person to whom it is addressed as the person to accept the bill. As has been stated, the acceptance of a bill is the signification by the drawee of his assent to the request of the drawer and such acceptance must be in writing on the bill and signed by the drawee. At page 363, Bhashyam stated that if there is no drawee named in the bill and a person accepts such instrument, such acceptance must be regarded as acknowledging that he is the drawee. At page 365 it was further stated that a drawee is under no obligation to the holder to accept a bill drawn on him, even though such refusal may be in breach of a contract between the drawee and drawer. Such contract will, however, entitle the drawer to sue the drawee on breach of contract. 6(1) The drawee must be named or otherwise indicated in a bill with reasonable certainty. A bill of exchange, being its original letter, should be properly addressed to the drawee. Where a bill was made payable 'at No. 1, Wilmot Street, opposite the Lamb, Bethnal Green, London', without mentioning the drawee's name, and the defendant accepted it, he was not allowed to make the objection. A bill cannot be addressed to one man and accepted by another. 14. In Halsbury's Laws of England, 4th Edition, Vol. 4 at page 153 in paragraph 352 it was stated that the acceptance of a bill is the signification by the drawee of his assent to the order of the drawer. Thereafter the drawee is called the acceptor. But the drawee, in the absence of any special agreement, is under no obligation to accept a bill. In paragraph 354 it was stated that the party primarily liable on a bill of exchange is the acceptor. The acceptor is the person to whom the order to pay is addressed. He is on the face of the bill as drawn, the drawee; but as such he is not, apart from special contract, by English law under any obligation to accept the bill. The drawee who does not accept is not, therefore, liable on the bill. In paragraph 356 it was stated that in the case of a bill of exchange, when the drawee does accept, he undertakes that he will pay the bill according to the tenor of the acceptance, but, where the drawee declines to accept, the drawer must bear all the losses and expenses incurred as well by reason of the non-acceptance as of the non-payment. In paragraph 357 it was further elucidated that wherever a bill is accepted the acceptor is and remains the party primarily liable on the bill whatever may happen to the other parties and whether any of the other parties are discharged or not. Should an endorser have to pay the bill, the acceptor by the fact of his acceptance is liable to indemnify him. 15. In the case of a bill drawn for the accommodation of another party, the actual position differs from that appearing on the fact of the instrument. The acceptor is only surety for the party accommodated, so that he is entitled to be indemnified by him, and if a holder has recovered part of the amount due from the party accommodated, he can only recover the balance from the acceptor. 16. "Acceptance" in regard to a bill of exchange is a technical term. It does not mean "taking" or "receiving." Acceptance of a bill of exchange is the signification by the drawee of his assent to the order of the drawer. It is the act by which the drawee evinces his consent to comply with, and be bound by, the request contained in a bill of exchange directed to him, and is the drawee's agreement to pay the bill when it falls due. In Commercial parlance acceptance of a bill of exchange is the drawee's signed engagement to honour the draft as presented. The contract of the acceptor is a new and independent one. 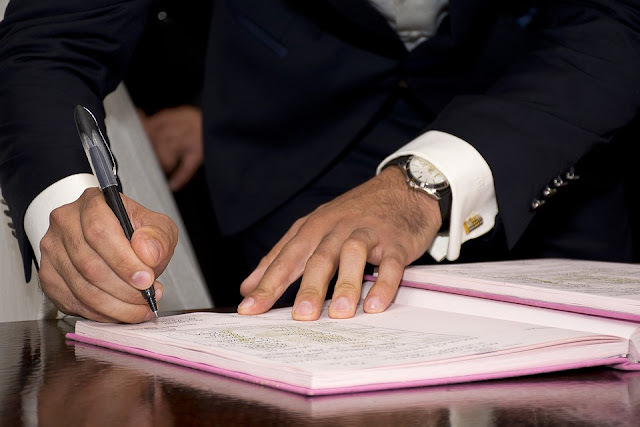 It comes within the rules as to consideration for a contract on a negotiable instrument, and, like every contract on a negotiable instrument, is incomplete and revocable until delivery of the instrument for the purpose of giving effect thereto. Acceptance, generally speaking, is therefore, necessary to render a drawee liable upon a bill of exchange and until he accepts it the drawee is not liable on the bill. As between a drawer and a drawee, the latter is to be under an obligation to accept a bill of exchange drawn by the former. Thus it is a well-settled rule of commercial law that no one but the person upon whom it is drawn, or his duly authorised agent, can accept a bill except for need or honour. We have, therefore, no hesitation to hold that no person accept as drawee of a bill of exchange can bind himself by acceptance. The drawee of the bill of exchange, in the absence of any contract to the contrary, on acceptance is the acceptor before maturity by the bill of exchange and is bound to pay the amount thereof at maturity to the holder on demand. When the drawee does accept he undertakes that he will pay the bill according to the tenor of the acceptance and he remains primarily liable on the bill of exchange as acceptor. 17. The question, therefore, emerges whether the CSC, first respondent, is the drawer-acceptor when addressed as MMTC A/c CSC Calcutta as extracted earlier. It is already seen that MMTC as a canalising agent and with a view to reduce financial burden to the end user (CSC) authorised CSC to directly open irrevocable letter of credit with a foreign supplier with prior intimation and CSC undertook to accept the liability under the bill and pursuant thereto MMTC stood absolved of its liability. CSC thus accepted to be the Principal importer of the steel billets from M/s. Harlow & Jones Ltd.; took irrevocable letters of credit and thereby had undertaken the liability to the foreign suppliers; on receipt of the cargo on bill of lading and the bills of exchange of drawer. M/s. Harlow Jones Ltd. had accepted the bills of exchange as drawee and had endorsement from MMTC on the bill of lading in its favour; and thereafter had and appropriated the goods. These admitted facts unmistakably show that CSC accepted the bills of exchange as drawee. 18. From this perspective the further contention of Sri Sen is that the bill of exchange being a negotiable instrument the court has to look to the tenor of the document on its face and no extraneous evidence oral or documentary is admissible in evidence nor is it permissible for the court to traverse behind the instrument to look to the intention of the parties, contracting or varying the terms of the instrument offending Section 92 of the Evidence Act. The proposition of law is unexceptionable since in the commercial world the negotiable instrument should receive acceptation on the tenor of the instrument on its face and generally it is impermissible to traverse behind it unless parties inter se are at ad idem to the contract in writing or by conduct preceding or succeeding the execution of the instrument or acted upon, as an aid to cull out their intention. In Deo v. Rias (1832) 8 Bing, 178, Tindal, C.J. held that "we are to look at the words of the instrument and to the acts of the parties to ascertain what their intention was; if the words of the instrument be ambiguous, we may call in the aid of the acts done under it as a clue to the intention of the parties. In Chapman v. Bluck (1838) 4 Ring, 187, Park J. held that the intention of the parties may be collected from the language of the instrument and may be elucidated by the conduct they have pursued. Odgers in his Construction of Deeds and Statutes, 5th Edn. by Dworkin at p. 53 stated that in the case of an ambiguity, judicial notice will be taken of the way in which the parties themselves have interpreted their rights and duties under the document. In the light of the facts and the conduct of CSC as discussed above it is clear that CSC authorised Harlow & Jones Ltd. to draw bills of exchange to its account for acceptance of the bills of exchange on its Account at its address. CSC, therefore, is the drawee and it validly accepted the bills of exchange as acceptor. 19. The word 'on account' of has been defined in Chamber's 20th Century Dictionary, New Edition, page 8. thus: "On one's own account 'means' "for one's own sake; on one's responsibility." The Random House Dictionary of the English Language, College Edition page 10. "On account of means "a. by reason of; because of; b. for the sake of." The Reader's Digest Great Encyclopaedic Dictionary, Volume 1, page 23. "On account of means "in consideration of; because of." Concise Oxford Dictionary 7th Edition page 7. "On one's own account" means "for and at one's own purpose and risk." Shorter Oxford Dictionary, Vol. 1 page 13. "On one's account" means "in his behalf and at his expenses." In Collins English Dictionary at page 9 'on account of in item 16, it is stated, 'because of; by reason of, In Black's Law Dictionary, sixth edn. relating to commercial transactions it is stated at page 18 thus "a statement of pecuniary transactions; a record or course of business dealings between parties....accounts payable...." In Ramanatha Aiyer's, the Law Lexicon, Reprint Edn. 1987, 'account for' is defined at page 17 thus "in respect of moneys" 'to render an account of and 'to be responsible for'. In Radhakrishna Sivadutta Rai and Ors. v. Tayeballi Dawoodbhai MANU/SC/0054/1961  Su(l). 1 SCR 81 though as rightly pointed out by Sri Sen did not relate to negotiable instrument', this Court considered the meaning 'on account of in relation to bought and sold notes in connection with jute goods through a broker. It reads thus: "To Radhakrishna Sivadutta Rai, A/c Khetan & Sons Ltd., Shewpur, Banaras', the bought and sold note, was addressed to the seller as "we confirm having sold on your account and risk, the undernoted goods, to M/s. Radhakrishan Shiv Dutt Rai with A.G. mark. A/c Khetan and Sons Ltd., Shewpur, Banaras." In that case the question was "who was the real purchaser of the goods in question". Gajendragadar, J. (as he then was) speaking for the court held that the appellant acted on account of the disclosed partner and as such he was not entitled to sue. It was also further held that whether the contract was entered on behalf of the principal recital in the relevant document could provide the necessary clue. The letters and the confirmation slips were held to be read in the light of the bought and sold notes and the conduct of the parties was presumed to be consistent with them. The signature or how the parties described themselves was held to be not relevant. The description of MMTC in the letters of credit or the bills of exchange is proforma compliance of foreign exchange regulations. CSC acted as independent principal importer and its acceptance of bills of exchange on its account was as drawee. We therefore, find force in the contention of Sri Ashok H. Desai that the plaintiff acted as Principal drawee and accepted the bills of exchange to its account undertaking its liability to honour the same and did act upon the instruments. Stamp 10s. "Due 28th May, 1975 1000 pounds stg. "Glasgow, 25th May, 1874. Twelve months after date pay to me or my order at the National Bank of Scotland's office, Queen Street, Glasgow, the sum of one thousand pounds sterling, value received. On those facts, House of Lords held that James M, Kinlay was not acceptor and the action does not lie on bill of exchange. Lord Watson held at p. 777 that "it is necessary to distinguish between the liabilities which the law merchant attaches to a person who, by signing, has become party to a bill, and those liabilities which may arise out of an understanding or agreement of parties extrinsic of the bill. In some cases the precise character and consequent liabilities of parties to a bill are conclusively fixed by the tenor of the document. The person who draws a bill of exchange, and his addressee who accepts it, can never, according to the principles of the law merchant, be liable otherwise than in their respective characters of drawer and acceptor". At p. 778 the learned law lord further stated that "in other cases the character and liability of parties to a bill cannot be ascertained without the aid of proof, as, for instance, when a dispute arises in regard to the order of time in which endorsements were made upon a bill. But such proof, when it is admissible, must be strictly limited to facts and circumstances attendant upon the making, issue, or indorsement of the bill. This leads me to consider whether the late James M. Kinlay, as a party to the bill in the sense of the law merchant, was under obligation, failing payment by his two sons or their firm, to pay the contents to Mr. Walker; and in so doing, I assume as legitimate materials for inference all those facts connected with the making, issuing, and discounting of the bill to which I have already adverted.... The tenor of the bill is, in my opinion, conclusive against the view that James M. Kinlay was an acceptor. Save in the case of acceptance for honour or per procuration, no one can become a party to a bill qua acceptor who is not a proper drawee, or, in other words, an addressee". At p. 782 he stated that "I am of opinion that the character in which James M. Kinlay did become a party to the bill was, both in fact and law, that of an endorser; and that in determining the legal position the circumstance that M. Kinlay indorsement was written before the bill was delivered to the drawer and the money advanced by him is quite immaterial. No doubt a proper indorsement can only be made by one who has a right to the bill, and who thereby transmits the rights and also incurs certain well-known and well-defined liabilities. (emphasis supplied) I fail to see upon what principle James M. Kinlay can be interpolated as a party to the bill in question between the drawer and the acceptor". At p. 785 he further stated that "I should have had less difficulty in holding that James M. Kinlay, as party to the bill, was an endorser, and therefore not liable to pay to Mr. Walker, the drawer, when it was dishonoured by the acceptors, had it not been that the point seems to have been otherwise decided by the Court of Queen's Bench in Mathews v. Bloxsome, 33. L.J. (Q.B.) 209. The report of the case is not satisfactory, and leaves room for doubt whether the decision was intended to go so far as the report states." At page 785 he stated that" being of opinion that James M. Kinlay was not, as a party to the bill, under any obligation to the drawer, and that there is no competent or sufficient evidence of his agreement to undertake such an obligation, I think the appeal ought to be dismissed. In the light of those facts it was held that James M. Kinlay was not an acceptor within the meaning of Section 11 of the Bill of Exchange. 21. The ratio in Sitaram Krishna Padhye v. Chimandas Fatehchand MANU/MH/0123/1928 AIR 1928 Bom 516 relied on by Sri Sen is also of little assistance to the facts in this case. The Hundi therein was in the following term: "Fifty six days after date I promised to pay Seth Chimandas Fatehchand or order the sum of Rs. 600 only for value received in cash. G.V. Athale, Managing Proprietor, Gangadhar and B. Friends, Sandhurst Road, Bombay No. 4. It was held that the person liable on the Hundi was Athale and not any alleged firm passing under the name of Gangadhar and B. Friends. 22. In the light of the above law and the facts of the case we unhesitatingly hold that the plaintiff, CSC is the drawee acceptor. In a suit based on the letter of credit laid by M/s. Harlow and Jones Ltd., CSC and the appellant suffered a decree in London Court which the appellant discharged and became a holder in due course. Based thereon the appellant filed Civil Suit No. 479/90 under Order 37 of the CPC against CSC which is pending in the High Court. Therefore, we do not therefore propose to express any opinion on merits of the liability of CSC. 23. Undoubtedly declaration of the rights or status is one of discretion of the court under Section 34 of the Specific Relief Act, 1963. Equally the grant or refusal of the relief of declaration and injunction under the provision of that Act is discretionary. The plaintiff cannot claim the relief as of right. It has to be granted according to sound principles of law and ex debito justitiae. The court cannot convert itself into an instrument of injustice or vehicle of oppression. While exercising its discretionary power, the court must keep in its mind the well settled principles of justice and fair play and the discretion would be exercised keeping in view the ends of justice since justice is the hall mark and it cannot be administered in vacuum. 24. Grant of declaration and injunction relating to commercial transactions tend to aid dishonesty and perfidy. Conversely refusal to grant relief generally encourages candour in business behaviour, facilitates free Row of capital, prompt compliance of covenants, sustained growth of commerce and above all inculcates respect for the efficacy of judicial adjudication. Before granting or refusing to grant of relief of declaration or injunction or both the court must weigh pros and cons in each case, consider the facts and circumstances in its proper perspective and exercise discretion with circumspection to further the ends of justice. From the back-drop fact situation we have no hesitation to hold that the relief of declaration granted is unjust and illegal. It tended to impede free flow of capital, thwarted the growth of mercantile business and deflected the course of justice. 25. Though the appellate court had exercised its discretion which the Trial Court negated it, in the light of the facts and circumstances of the case this is a fit case for interference. The appeal is accordingly allowed. The judgment and decree of the appellate court are reversed and the decree of the single Judge is restored and suit stands dismissed with costs throughout.